A Guide to the Southwest Virginia LGBTQ History Collection. 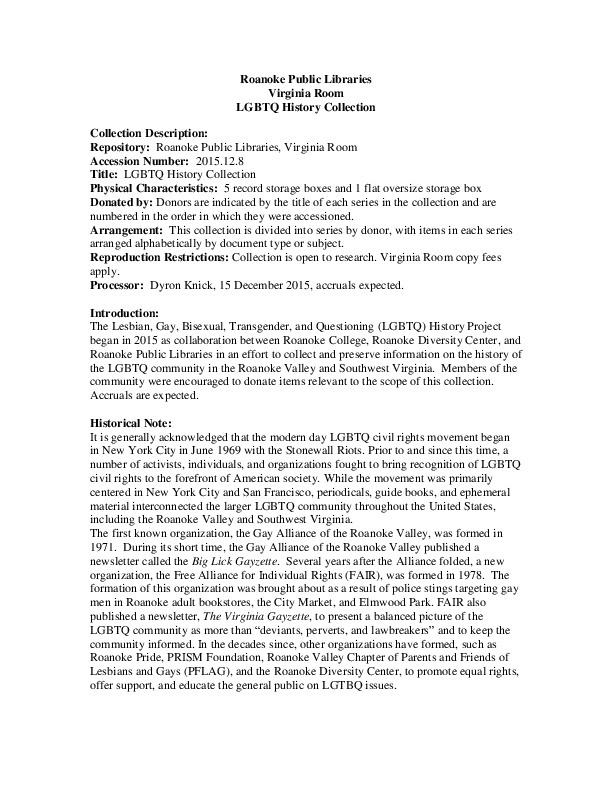 This is a guide to the the Lesbian, Gay, Bisexual, Transgender, and Questioning (LGBTQ) History Project began in 2015 as collaboration between Roanoke College, Roanoke Diversity Center and Roanoke Public Libraries in an effort to collect and preserve information on the history of the LGBTQ community in the Roanoke Valley and Southwest Virginia. Members of the community were encouraged to donate items relevant to the scope of this collection. Accruals are expected. Also included is a subject index for the project's Oral History Initiative. Collection is open to research. Virginia Room copy fees may apply. Southwest Virginia LGBTQ+ History Project, “A Guide to the Southwest Virginia LGBTQ History Collection.,” Virginia Room Digital Collection, accessed April 24, 2019, http://www.virginiaroom.org/digital/document/LGBTQHistory.